It was only recently when I learned about Terry Fox's life story and what this run was all about. It started with an email, where our office invited its employees to the Terry Fox Run. When me and my husband searched online, we discovered the heart-warming story about this guy who had cancer, had his leg amputated, and was still able to help make the world a better place. His story is a touching one, and I am sure if you go online, you will find many stories written about his life and what he has done. 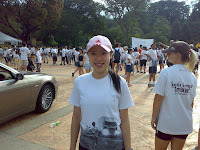 When we arrived at the Lake Garden (a beautiful garden at the heart of Kuala Lumpur), where this year's Terry Fox Run Kuala Lumpur was held. 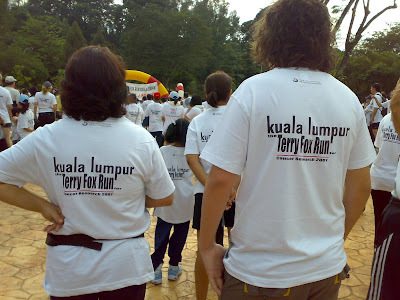 We were overwhelmed by the number of people who showed up, with their Terry Fox t-shirts! (Shirts were sold at RM25- each). It was amazing to see so many people, who came with friends and families, to show their support for this good cause. I'm not sure what was the number of people that turned up that day. All I know is that the organizer of this event did a pretty good job at promoting it. They even had t-shirts in all sizes: from toddler sizes all the way to big ones. It was so cute seeing young kids in their tiny tees walking / running with their parents. It also seemed like a blessing as we had great weather that morning run. Overall, it was a good and memorable experience for me. I would not have discovered his story if I was not living in KL. Will surely look forward to the 2008 run. See you there!